Hillsboro American Legion Post No. 6 celebrates its centennial with a May fun run and cake. Veterans across the country are celebrating this month, with the 100th anniversary of the American Legion. But members of Hillsboro's Legion Post No. 6 had another reason to cheer on Saturday, March 16, as they sang out "Happy Birthday," and passed out servings of cake. This month also marks the 100th anniversary of the Hillsboro post, which has been serving local veterans in downtown Hillsboro since 1919. To celebrate the post's centennial, the group is organizing a fun run this May in observance of Memorial Day. The American Legion, a veterans organization open to men and women who served in the armed forces, officially formed in Paris as a way to boost the morale of American soldiers after the end of World War I as they waited to return home. Over the next century, the Legion swelled to more than 3 million members after World War II. Legionnaires have made a big impact on local and national politics, according to longtime Hillsboro post member Rob Liebenow. It was the Legion which helped pass the first GI Bill in 1944, and it was students at a Legion-sponsored civics program where the idea of Oregon's Bottle Bill was first conceived in the early 1970s, Liebenow said. Likewise, Oregon plays a big role in the Legion's history. One of the organization's co-founders, George White, was the former editor of The Oregonian newspaper. The organization named southern Oregon veteran Charles Schmidt its national commander three years ago. Liebenow, 70, joined the American Legion in 1972 at the request of a co-worker. America's involvement in the Vietnam War was coming to an end and Liebenow, having returned to Hillsboro from the Navy, was looking for a place to belong, he said. Today, Liebenow lives and breathes the American Legion. Liebenow serves as Oregon's representative at the organization's national level and sits on the group's board of directors. 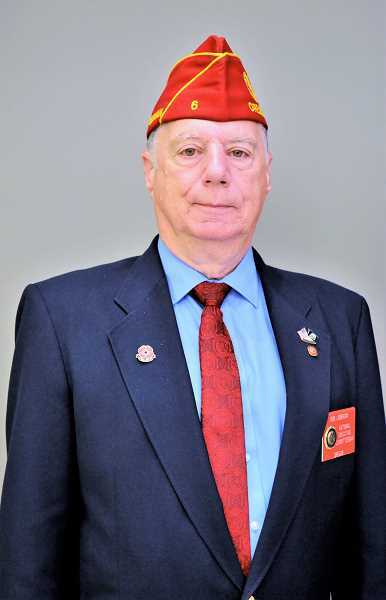 "When my kids were little, our vacations were to go to American Legion conventions," he said. The Legion works on a variety of veterans-related issues as well as youth programs, he said. "We do what we can for local veterans, and families in need," Liebenow said. The group sends care packages overseas to soldiers, and supplies U.S. flags to local businesses. It sponsors local Cub Scout packs and collects gifts at Christmas time for local veterans. It sponsors baseball teams and the annual Boys State and Girls State leadership programs, held each summer. When veterans in the community are in need of financial help, the Legion has been known to collect money to help people purchase groceries or pay their rent. "There was one young mother, a veteran, she was a single mom and we helped her out with food and gas and paid a few of her bills," Liebenow said. But there's always more to be done, he added. "If we don't know about (a veteran's problems,) there's not much we can do." Nationally, the American Legion lobbies Congress on veterans' issues, such as a current bill that would allow veterans who served aboard ships off the coast of Vietnam disability benefits and healthcare due to Agent Orange-related ailments. David Bogner, a former Navy radioman during Vietnam, has been a member of the Legion for 29 years. He said there's a lot of work that needs to be done to support local veterans. "I'm concerned about folks who serve their country who end up living in the street," he said. "How can we allow that to happen? Somebody's got to do something about this. I do what I can do." 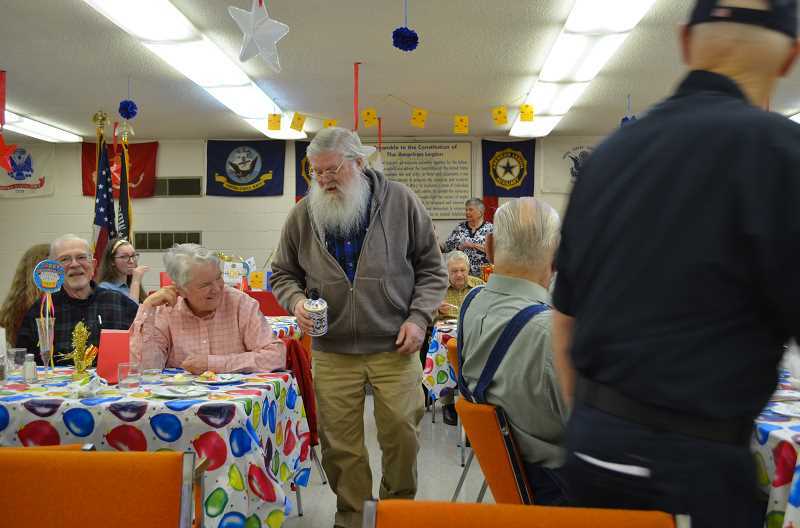 The Hillsboro Legion has about 250 members, small for a city Hillsboro's size, Liebenow said. "We're a very well-kept secret in Hillsboro," Liebenow said. "In a community the size of Hillsboro we should be 500 or 600 members." Growing up, Liebenow said, the post was a major community partner. "Anybody and everybody that fought in World War I and World War II belonged to that post," he said. "Back when Hillsboro was a town of 5,000, the Legion was more noticed in the community. And we did a lot in the community." 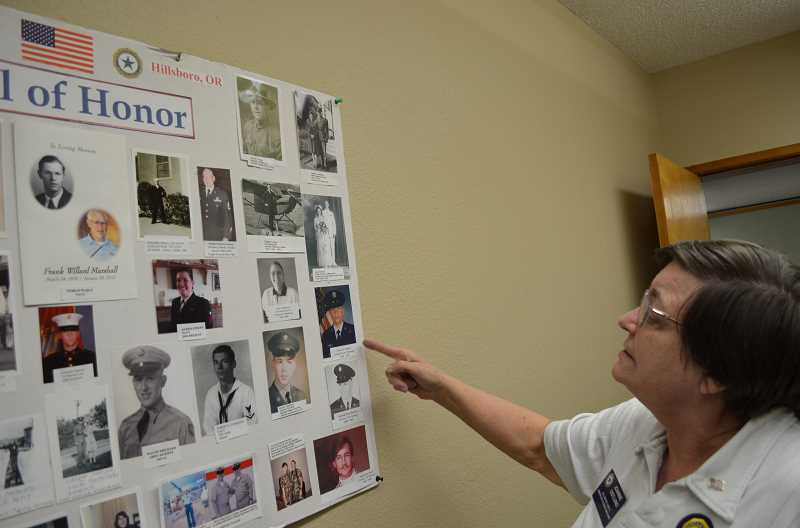 But as Hillsboro got bigger, and the number of World War I and World War II vets dwindled, membership has stagnated. Much of the organization's membership today is made up of Vietnam veterans. Liebenow said there is an active push to recruit new members. Anyone who served in the armed forces during wartime is eligible to join the Legion, he said. "There are some younger folks who are joining, but most aren't taking the time," he said. "They're still young. They're getting jobs and raising families." That was true for Sheryl Loberger, the post's Sergeant-at-Arms. She served in the Marines in the 1990s and joined the post five years ago. Like many younger veterans, Loberger said she didn't join the Legion at first, because she was raising her family, but came to the organization as her children grew up. "It seemed like the right thing to do," Loberger said. "We're veterans wanting to help veterans. That's what we're about. That's what keeps us going." More than anything else it does, the post's commander Bob Gnos said the Legion has been a family to service members after they return from war. "It becomes a brotherhood," he said. "In the military, you learn that you depend on the guy next to you, and he depends on you. You have to be reliable and do what is required. You can't just sit down and take a break from it. It's a 24 hour a day job, supporting each other." Joanne Ostlund, and her mother Blanche Anderson are both members of the Post's Auxiliary, which is made up of family members of servicemen. Ostlund joined the Auxiliary 36 years ago. She said she can't think of a better way to give back to her community. "I appreciate the freedoms I have, and I have them because of them," she said, gesturing to the veterans during Saturday's celebration. "I can go to the church I want, I can go the school I want. I can meet in a hall like this. They've put their lives on the line and a lot of them have been through a lot."